Cardinal climber (Ipomoea sloteri) is one of those plants that fully lives up to its name. The blossoms of this hybrid plant are a true cardinal red and the vine reaches for whatever it can grab. This is a very graceful, airy annual vine, related to morning glory (one of the parent plants of this hybrid). It blooms profusely throughout the summer and the red, trumpet-shaped flowers are big favorites of hummingbirds and other pollinators.The bright green leaves are triangular, with deep, narrow lobes that give them a lacy appearance resembling that of small palm leaves. 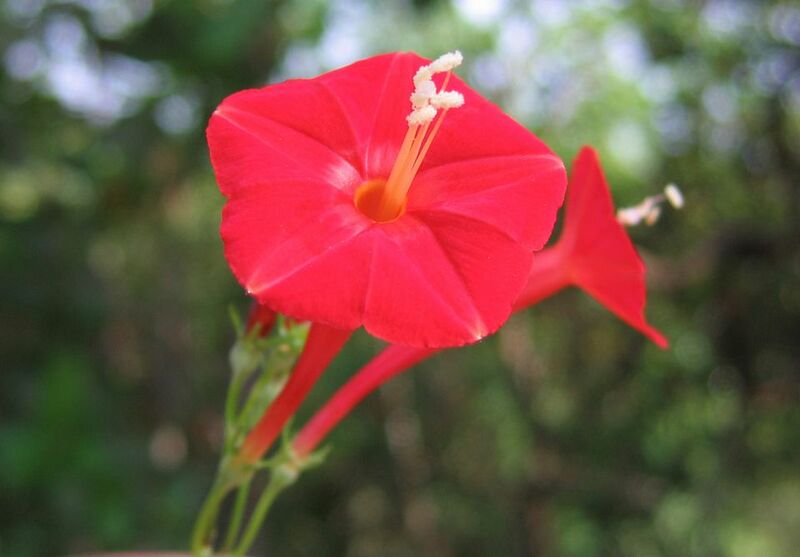 The tubular flowers are red, with white or yellow throats. Five petals overlap to form a swept-back pentagon at the opening. Plant cardinal climber in any well-drained soil, in a full-sun location. It requires regular water but does not need to be fertilized unless the soil is poor. It is often planted from potted seedlings, but it can also be seeded directly into the soil, covering the seeds 1/4 inch deep. Space plants 6 to 12 inches apart. Cardinal climber prefers full sun but will tolerate part shade. This plant does well in any well-drained soil; it prefers a neutral pH. Cardinal climber will tolerate dry soil, but its parent species are tropical plants, and it grows best if kept moist. Make sure it gets at least 1 inch of water each week, either through rainfall or irrigation. Cardinal climber doesn't like prolonged periods of dryness. This plant like hot, humid weather for best growth; cool weather will cause it to grow slowly. This plant rarely needs feeding, unless the soil is very poor. The seeds of this plant are extremely toxic if ingested, both to pets and humans. Symptoms include diarrhea and vomiting, as well as muscle tightness and numbness of the arms and legs. Like morning glories, cardinal climber seeds contain LSA (lysergic acid amide), an alkaloid structurally similar to LSD. Ingesting the seeds may cause hallucinations. Make sure to keep pets and children away from this plant, and take care to store seeds securely if you are saving them for propagation. This hybrid grows true from its seeds. You can allow the seed pods to dry on the plants and then collect the seeds to plant the following year. This plant is sometimes grown in pots with upright trellises, or in hanging baskets. It is often grown alone since it has a tendency to overwhelm other plants in mixed pots. You can sow seeds directly into the garden after danger of frost has passed, to a depth of 1/4 inch. Or, they can be started indoors 4 to 6 weeks before the last frost of the winter/spring. The seeds have a hard shell and germinate best if some type of scarification is done before planting. The easiest method is to soak them overnight. If you're really ambitious, you can rub them gently with some sandpaper and then soak them overnight. Seeds should germinate within 10 days. Give the young plants a regular weekly watering of at least 1 to 2 inches while getting established. Cardinal flower is a hybrid of cypress vine (Ipomoea quamoclit) and red morning glory (Ipomoea coccinea) and is sometimes confused with those plants since it shares characteristics of both. However, its leaves are distinctly different than the fine, feathery leaves of cypress vine and the heart-shaped leaves of morning glory. Cardinal climber is often planted near a trellis or other structure that it can climb; it can also be used as a dense ground-cover. The delicate, lacy leaves form a peek-a-boo screen rather than blocking the view entirely. This makes them great for training over an arbor or trellis. They are also a good choice for softening a wall and adding an airy feeling. Cardinal climber can also be grown in containers. Add a support in the container for even more height. They look wonderful growing around an obelisk, in the center of other flowers. In warmer climates, all members of the morning glory family (Ipomoea) can become aggressive self-seeders. So far, only the Arizona Department of Agriculture has banned their sale. Cardinal climber is virtually pest-free. If the vines get too thick, they may attract whitefly. Insecticidal soap should control the problem.